So I have one liter of Peanut Butter Cup Ice Cream, that I made a few days ago in my fridge, what can I do with this? Of course the obvious answer is eat it, but as I blogger I feel it is my duty to figure out something else creative I can do with it. How about I turn this ice cream into a pie with some banana slices and a chocolate chip cookie crust. Sounds perfect! When I was in culinary school I got a fantastic cookie recipe from my instructor/chef and it still remains on of my favorites to this day. It is also great because you don't need a stand mixer or beater to put this together, just a wooden spoon or spatula and some good arm muscle. This recipe is in ounces because that is how I originally received it. 1) Preheat the oven to 350F. 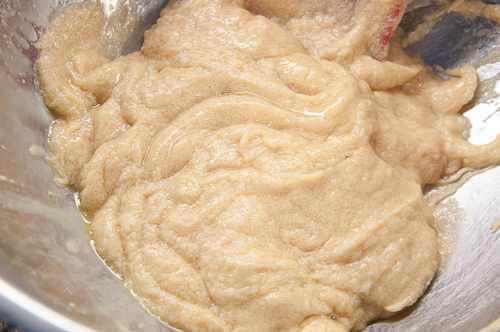 Mix together the sugar, shortening and butter with a wooden spoon until well combined and smooth. 3) Combine dry ingredients in a bowl and then add to wet mixture until just incorporated. Fold in chocolate chips. 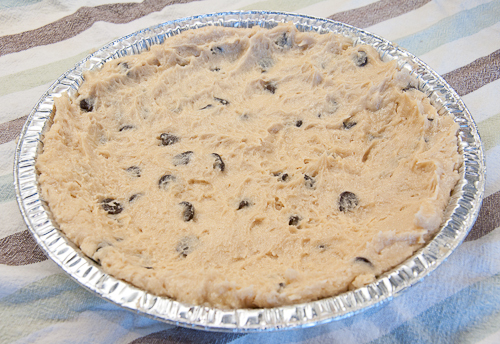 4) Press the cookie batter into a pie tin so it is about 1/3 inch thick. You have two options here. 1) Let bake allow it to puff like a regular cookie would. When completely baked and cooled scoop out some of the cookie center to create a pie crust shape. Do not scoop out too much that you create a hole in the bottom. 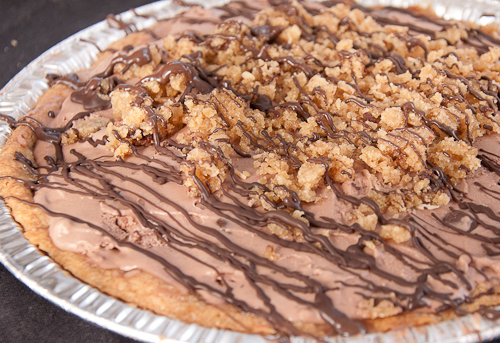 You can then place these scooped crumbs on top of the pie before the chocolate drizzle. Option 2) Bake the cookie for 5 minutes, remove form the oven and then place some tinfoil on top of the cookie with some dried beans as if you were "blind baking" a typical pie crust. 1) Take the peanut butter ice cream out of the freezer about 10 minutes ahead of time to soften so that you can press it into the pie. 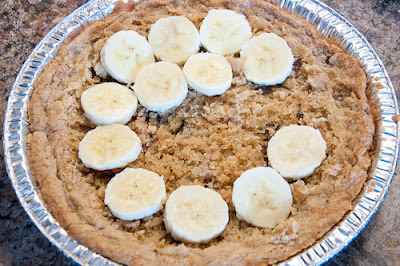 2) Place the sliced bananas on the bottom of the crust, completely covering it. 3) Scoop some of the ice cream on top of the bananas. Using a metal offset spatula smooth out the ice cream to cover all the bananas and crust. 4) Melt the dark chocolate in the microwave safe bowl for 30 secs, stirring and repeating until melted. Drizzle over top of the pie. 5) Chill in freezer for an hour or longer before serving. So, What’s better than homemade ice cream? Homemade ice cream in a cookie pie! I was so pleased with this creation. This is the one pie you can eat with your hands , the cookie crust acts like a cone holding the ice cream in place. 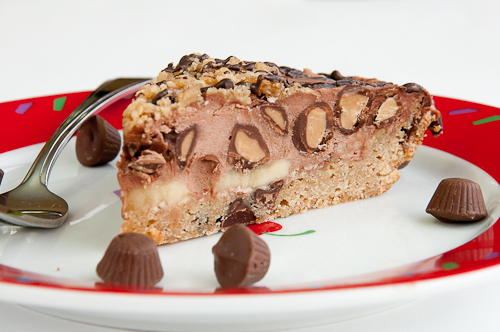 The cookie crust is a great recipe, even just for chocolate chip cookies. I would make this again and again. The bananas may have been a bit over powering for the peanut butter ice cream but the combination of the two is still never fail. I see a summer party variation of this in my future. Look at all those peanut butter cups! YUM! WOW... so much to this! I am in love!